The time has finally come. RG3 is going to take the field as a Washington Redskin. Sure it is preseason, but to be overly dramatic, Redskins fans have been waiting for this day since 1991. Well, not really. Every year right before the first preseason game is the day fans have been waiting for since 1991. Whether it be big free agents (McNabb), a secret quarterback somehow magically discovered by Mike Shanahan (Beck), or a guy not even drafted #1 overall who is already a Hall of Famer in fans' eyes (RG3), the Redskins have been pumping up the fans for the past 3 seasons, and that is just with the QB position. Redskins fans buy right in. As a fan what other choice do you have? Fans want to see the latest and greatest quarterback in a "real" game. This is their first chance. But if preseason were an indication of what will actually happen when the season begins, then why did the Redskins even draft RG3? 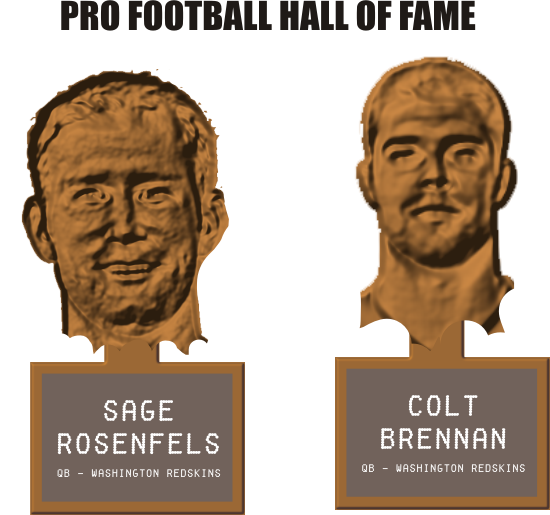 Colt Brennan should be the starting quarterback in DC, replacing Hall of Famer Sage Rosenfels. Colt should be trying to lead the Redskins to their 3rd straight Super Bowl this season. Washington DC, where preseason legends are born. Unfortunately/Fortunately for Redskins fans, the preseason does not mean much at all. Colt Brennan is currently sitting in a drunk tank somewhere and the Washington Redskins haven't won anything. So when RG3 takes the field tonight it will be wonderful. Wonderful for the fans. Wonderful for ESPN. Wonderful for rookies like RG3. What it won't be is telling. It won't be History. It won't be the Future. It will be a good opportunity to practice for a young NFL quarterback.